My friend Maribeth recently picked up a Mobiky Genius folding bike and she let me try it out. The Mobiky Genius is a cute folding bicycle with tiny 12 inch tires that folds up very quickly and fairly compactly. Mobiky seems to market primarily to the general aviation and yachting crowd, who like folding bikes because they fit into the limited space available to their craft, but it has a number of sensible commuter features as well: it folds (obviously) for the multimodal commute and limited office space storage; the chainguard and fenders keep your trousers clean; a kickstand holds the bike up; and the bike and components are all sturdy and low maintenance materials and construction. Unlike the Strida, you can even wear a skirt or kilt on this bike with its ultra low frame. The three second claim seems a little optimistic for a complete fold, but pushing the seatpost in then pulling up on the middle handle results in an very quick fold on the run, which can be handy when you’re running for the bus or train. You can then fumble with pushing the handlebar and saddle in on the telescoping posts and folding the pedals in after you’re on board. The handle works very well to tote the 13.5kg/30 lb weight of this bike. The kickstand is especially handy because it works to stand the bike in both folded and non-folding configurations! The Mobiky Genius rides about like you’d expect a bike with 12″ wheels and short wheelbase to ride. The ride isn’t that good, but for short commutes the Mobiky does the job. 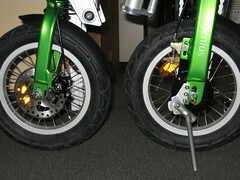 The wide tires do a good job of absorbing bumps, and I can barely ride no-handed on the Genius but it takes some effort. Front and rear disc brakes adequately stop the bike. The bike chain is a little noisy — I don’t know if it’s the unique double-chain configuration that adds noise or something else. It’s not really annoying, just noticeable and I’m sure it you get used to it with time. It’s geared fairly low — on the flat area I rode in I was in the highest gear and wished I had something higher — but 3 speeds give you the options you need to ride on hilly terrain. Mobiky is apparently changing some components — the US distributor’s website lists a Sturmey Archer 3 speed hub, but Maribeth’s bike came with SRAM’s 3 speed hub. The frame feels solid, and Mobiky claims riders up to 230 lbs can ride this bike. The handlebars and seatpost have a wide adjustment range to accommodate cyclists from 52 inches to 72 inches tall. A 16″ wheel version is also supposed to be available Real Soon Now. I saw it at Interbike but didn’t get a chance to try that one out. 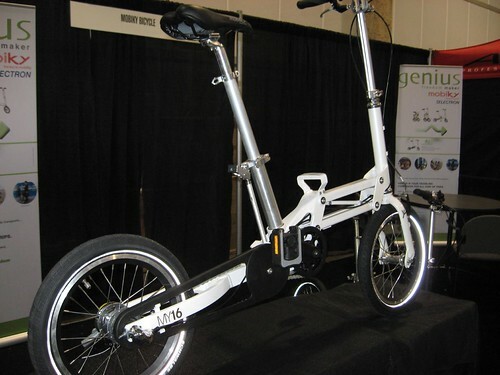 Overall, the Mobiky Genius is a reasonable folding bike with good components that folds quickly and compactly. Larry at RideThisBike.com reviews the Mobiky Genius, and also makes the Mobiky Genius available for purchase from his online store for $699, which includes a carrying bag. 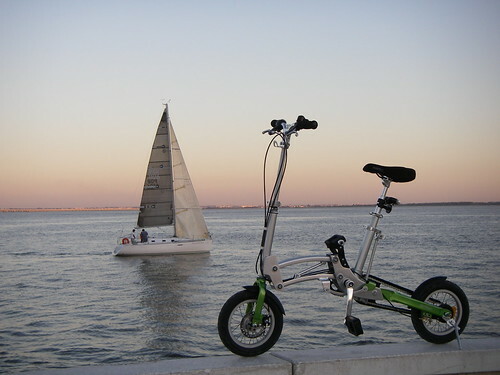 Some of the above photos are from folding bike fan Ana Banana in Portugal. Click on the photos for more info and captions. Wow, now that was unexpected! Seeing myself coming up on my Google Reader feeds. 😛 About the new models, there’s a video tour of them by Mobiky’s Export Manager, Arnaud, available online. And it has been reviewed also by Folding Society’s blog, as well as by british magazines Velovision and A to B (just follow the links here). 30lbs? how is that little thing so heavy? 30 lbs?? my 4130 29er is lighter than that! my mt bike is 23 lbs, with front suspension. You get what you pay for. The Strida is about 10 pounds lighter than the Mobiky, but the Strida has no gears on it, a less comfortable ride, a little bit less flexibility in size adjustments, and a lower rider weight limit. The SRAM hub adds about 3 pounds to the bike. The handle and folding mechanisms on the Mobiky probably add another 7 or 8 pounds. All these little things add up. Like Ana mentioned, it doesn’t really feel that heavy — it carries very easily. A full size bike at 30 pounds is awkward, but the Mobiky was designed to carry around. Where did she buy the Genius from? I just purchased one and it came with the Sturmey Archer hub, along with a torn carrying bag and some broken plastic parts on the bike itself (from shipping damage, the bike is new). I’m wondering if I got stuck with older stock or if they just randomly swap between components, because last I heard they were going to use Shimano nexus hubs. Maybe they just buy whatever hubs they can get at a decent price. Maribeth got the bike from a dealer in Palo Alto, CA who sells folding bikes. I had heard about the change to Shimano also so I was confused to see SRAM. Larry @ Ride This Bike specializes in folding bikes and can probably tell you more. does anyone here have a downtube bike? i’m thinking about getting one but i’m in need of advice in general on folding bikes for someone who’s petite. would a mobiky be better? or what about these ones? /www.downtube.com/ss-index.html i don’t want to get something that’s too heavy or unweildy, you know? i’d appreciate any help! does anyone here have a bike from downtube.com? i’m thinking about getting one. is it a better buy than mobiky genius? i’m pretty petite so i don’t want anything too big or heavy. i’d appreciate anyone’s help on making my first folding bike purchase! Tekdemon, if you have not contacted MobikyUSA yet regarding the broken plastic parts and torn bag, do so without delay. That’s highly unusual and I’m sure they’ll take care of you. I have heard reports of slight variations in components but have not seen this myself. Fritz, the latest from Mobiky is that they will not be switching to Shimano any time soon. Mobiky is concerned about being able to get a sufficient quantity of Shimano hubs. Also, the 16″ Mobiky is still in testing in France. I’d be surprised if it’s released before Christmas ’08. Laney, DownTube produces good quality folding bikes at a great value. Their bikes tend to cost less than the Mobiky; however, the ultimate factor should not be price. Instead, buy your bike based on which bike is a better fit for you and how you plan to use the bike. For example, how tall are you? How many miles long do you expect your typical bike ride to be? Do you plan to take the bike on the bus or subway regularly? Do you ride in a flat or hilly area? Will you need to carry the bike up or down stairs regularly? A folding bike can change your life. If you’d like help selecting the right folder, feel free to contact me. My mobiky has been nothing but trouble since new some years ago I have had the spokes break on nearly every occasion We have used it. At the moment I have been away with a friend, he used the mobiky cycle only for yet again another spoke broke, it’s so frustrating . Can a solid wheel frame be made and. used?